Rigol's DSA700 series spectrum analyzer makes radio, IoT, and educational/hobbyist measurements more accessible than ever with value analyzers designed for lower frequency RF test. The DSA700 shares the popular mechanical package of the DSA800 series analyzer with a focus on measurements below 1 GHz. 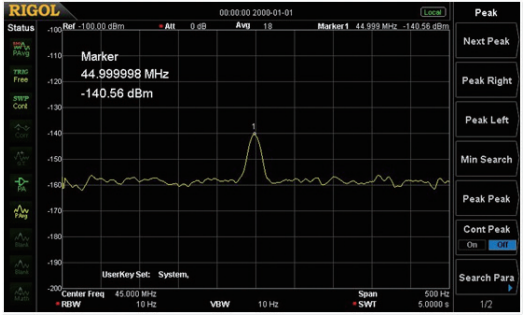 The spectrum analyzer offers the ability to measure smaller signals using our digital IF filter, which allows for smaller bandwidth settings and reduces displayed noise levels. The DSA700 also distinguishes between signals with a frequency difference as little as 100 Hz. The DSA700 has the capability to monitor FSK signals with the 2FSK-DSA option. A complete spectrum analyzer for your low frequency signals and systems at an unprecedented price. Low Noise floor as low as -130 dBm View lower powered signals (harmonics, interference sources) and ease trouble-shooting. 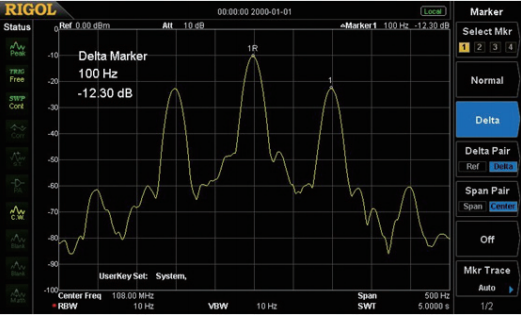 Displayed Average Noise Level determines the lowest power level an analyzer can resolve. It is effected by settings including PreAmps, Attenuation, and RBW. On the DSA700 Series, Typical DANL is as low as -130dBm. The Preamplifier is standard on all DSA700 Series models. EMI PreCompliance measurements (option) Use FCC bandwidths, EMI filter, and QuasiPeak Detector to make PreCompliance measurements during the design process saving time and money getting new products to market. The Rigol DSA series of spectrum analyzers are ideal for performing near-field probing, conducted, and emitted precompliance measurements. Add the S1210 PreCompliance software, Near Field Probes (NFP-3), and the EMI-DSA800 option to make complete EMI PreCompliance measurements with the DSA700 Series analyzers. Resolution Bandwidth sets the distance between measurements in frequency. This is important, for instance, when you need to differentiate between 2 carriers that are only 500 Hz apart. They can't be viewed as distinct signals with a RBW setting as large as the separation. Standard PreAmplifier included The PreAmplifier significantly improves the instrument's noise floor enabling users to monitor and debug smaller signals. 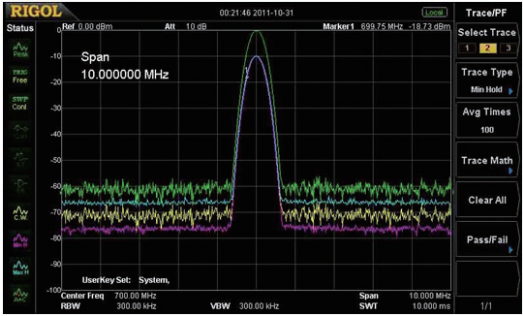 Small signal detection and differentiation is critical to modern RF design and debugging. The standard preAmplifier on the DSA700 Series spectrum analyzer makes these signals and their characteristics easier to evaluate and improve. Instrument Carry Case for a DSA800 Spectrum Analyzer, DG4000 generator, or DS2000 scope. Real Time signal capture option for the spectrum analyzer. 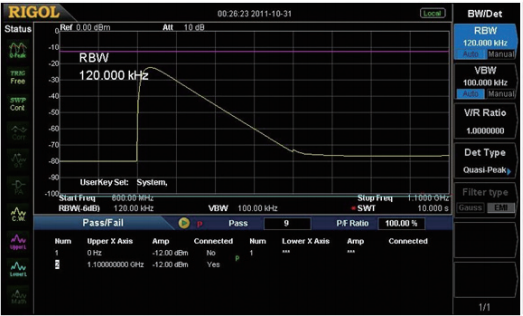 Enables 1.5 MHz of real time capture for signals like FSK. Works on the DSA700 series and the DSA815 or DSA815-TG. EMI PreCompliance Software for RIGOL Spectrum Analyzers. Requires EMI option to be enabled on the instrument. Software for controlling and analyzing data from RIGOL spectrum analyzers. DSA Accessories Package including cables, adaptors, and antennas.